Can’t sleep? 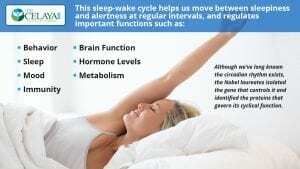 What is my circadian rhythm? Although we’ve long known the circadian rhythm exists, the Nobel laureates isolated the gene that controls it and identified the proteins that govern its cyclical function. Humans are similar to other animals in that our internal clocks are set to the rising and setting of the sun. A healthy sleep-wake cycle is critical for many aspects of our health. Circadian rhythm imbalances increase risk for heart disease, obesity, mood disturbances, diabetes, cancer, dementia, and Alzheimer’s. Despite the circadian rhythm’s intuitive design, our modern lives tend to sabotage its critical balance. Some disruptive factors can’t be avoided while others can, but for most we have the tools to minimize the negative effects. Daylight savings time changes throw a kink in our daily rhythm. The time change is minimal, but studies show rates of driving fatalities, workplace injuries, suicides, and heart attacks rise after the spring-forward change. And night owls take the longest to recover. Prepare for daylight savings time by shifting your bedtime and waking time a bit every day the week before. Everyone laments how jet lag can wipe you out. Jet lag occurs when the time of day doesn’t line up with your body’s clock. Crossing two time zones should take you about a day of readjustment; crossing six could take three days or more. But beware; chronic time zone jumping can lead to a suppressed immune system, chronic fatigue, and memory issues. Plan ahead by moving your body’s time clock toward the destination time zone during the week before. Hydrate before and during the trip. Choose a flight that gets to your destination in early evening and stay up only until 10 p.m. local time. If you arrive early and are exhausted, take a two-hour nap but no longer. Once at your destination, expose yourself to the sun’s rays to help your body sync up with the new time zone. Twenty percent of the population is estimated to sleep too little (less than 6 hours a night); this can lead to changes in genes that regulate stress, our immune system, sleep-wake cycles, inflammation, and aging. Chronic sleep deprivation is linked to heart disease, diabetes, obesity, stress, inflammation, dementia, and depression. The CDC says insufficient sleep is a public health epidemic and research has established that the constant exposure to blue light from electronic devices is a major culprit. Changes in the levels of the hormone melatonin in your body are what make you fall asleep. During a normal day, morning light stimulates the body to decrease your melatonin level, promoting wakefulness, then as the day darkens, melatonin increases to encourage sleep. However, adults and children disrupt this cycle by using smart phones and tablets late into the night. This can cause chronic insomnia because the blue light these devices emit is perceived by our brains as daytime light, which suppresses melatonin and keeps us awake. Sleep can be precious. To learn more about your sleep problems, schedule a FREE 15 minute consultation with Dr. Celaya. Minimize blue screen time. Read a book instead. Turn off all screens (phone included) two hours before bed. If you can’t do that, get a pair of orange safety glasses. Proper patterns of light exposure during the day are a major factor affecting how well we sleep. Start each day with as much bright light as possible. Eat breakfast with as many lights on as possible to stimulate serotonin production, which helps melatonin production later in the day. Get light during the day at home and work. Open the shades; turn on all the lights (try full-spectrum); sit by a window and look out often; take a walk outside during your breaks. Minimize light in the evening by dimming or turning off unnecessary lights. Put orange bulbs in lamps you use at night, especially next to your bed and for reading. This helps to jump start melatonin production in preparation for sleep. Patterns of light during the day aren’t the only way light affects our circadian rhythm; exposure to actual sunlight is key for healthy function of the body and brain. 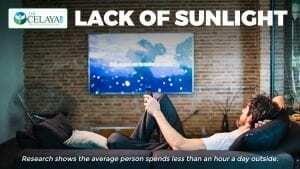 Research shows the average person spends less than an hour a day outside. Shift workers spend even less time outdoors. Lack of exposure to sunlight inhibits production of melatonin, affecting sleep and potentially affecting our ability to produce Vitamin D, key for bone health, mood regulation, and immune function. Get direct sunlight every day. If you can’t get outside, use a quality light box early in the day. Go sunglasses-free even for just 10–15 minutes, to provide beneficial sunlight exposure to your eyes and brain. Your body’s innate sleep cycle is largely controlled by the amount and pattern of light and dark you are exposed to each day. By managing the lifestyle factors that disrupt your circadian rhythm, you will support your body’s ability to function well and stay healthy. If you would like to get to the root cause of your sleep issues, you can schedule for a free consultation with Dr. Celaya.